Jayson Musson, On Some Faraway Beach, 2012, mercerized cotton stretched on linen, 111 x 84 x 2". The striking thing about Jayson Musson’s “Halcyon Days” is its apparent seriousness. 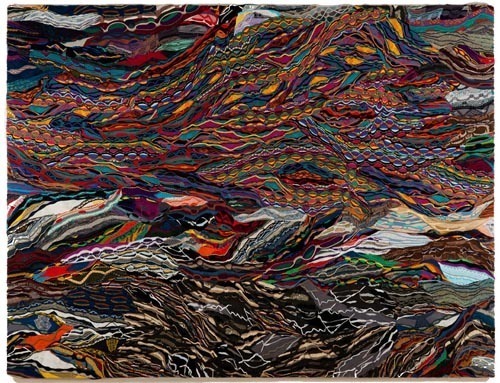 This is an exhibition, after all, of fragments of Coogi sweaters that have been stitched together and stretched to look like abstract paintings. Know for its computer-generated designs, loud colors, and brash patterns, the Australian high-end knitwear line was founded in 1969 and worn in the 1980s and ’90s by Bill Cosby (when he ran low on Koos Van Den Akker or Missoni), by Phyllis Diller (as a joke) and by the Notorious B.I.G. (as a way of looking rich while still offending white bourgeois taste). Musson is perhaps best known as the creator of Hennessy Youngman, the gold-medallioned, revolver-brandishing persona who, in the online video series “Art Thoughtz,” faux-naïvely but incisively explains the mysteries of contemporary art while (sometimes) wearing Coogi. Hennessy is absent from “Halcyon Days,” and Musson has taken scissors to the character’s wardrobe. Fragments from dozens of sweaters have been carefully assembled into a series of abstract compositions with varying pictorial aims. The largest, On Some Faraway Beach (all works 2012), resembles a landscape with a swirling, colorful sky made up of rows of circles, vaguely resembling van Gogh–like brushstrokes. An Invitation to Look Somewhere Else lacks any figurative imagery; its undulating bands of color and pattern clash unapologetically on fabric that is wrapped thickly around its small wooden support. Like a flashy poisonous frog, it has an almost apotropaic effect, aesthetically repellent yet rife with compelling visual detail. The premise behind “Halcyon Days” sounds like a joke. But it can only be a good joke if viewers can forget that it’s a joke at all, if we can take seriously the proposition that these Biggie-approved, textile-based, computer-generated abstractions should be seen as artworks in their own right. In the end, the joke may be on us, but it’s well worth taking the bait.